Please help support the continuation and further development of the Queen of Prep exhibit and educational programming. Tax deductible DONATIONS can be made in any amount! The Queen of Prep: Lilly Pulitzer Rousseau exhibit has been organized and developed by the Museum of Lifestyle & Fashion History and is on display now at the donated location for the Museum of Lifestyle & Fashion History at the Boynton Beach Mall in Boynton Beach, Florida. The exhibit includes various educational programs about design. Nearly 80 vintage Lilly Pulitzer items for women, men and children; fabrics, accessories; a limited edition Lilly juice carton and animal crackers; galoshes, cocktail trays and napkins; and photos have been provided by more than 20 collectors from throughout the USA and the State of Florida. Some collectors are from Cincinnati, Ohio; San Francisco, California; Shingle Springs, California; Philadelphia, Pennsylvania; Saratoga, New York; as well as from cities in Florida such as Longwood (Orlando), Safety Harbor (Tampa Bay). Wellington, West Palm Beach; Boynton Beach; Delray Beach; Highland Beach; Pompano Beach; Fort Lauderdale; Parkland and Miami. The exhibition is chronological beginning with the family history of Mrs. Lilly Pulitzer Rousseau to present day. Mural art inspired by the iconic prints in the Lilly Pulitzer designs has been created for the exterior gallery wall by Boca Raton High School student, Skyler Carosella. Skyler is a resident in Boca Raton and hopes to pursue a career in fashion. Other mural art design for the interior of the exhibit gallery was created by Natalie Nelson of Boynton Beach, FL. Natalie studied art at Florida Atlantic University (FAU) from which she graduated. MLFH developed a curriculum partnership with the Miami International University of Art & Design for the Queen of Prep exhibit. 30 students created designs that were inspired by the iconic Lilly Pulitzer designs. Some of the student Lilly-inspired fabric designs are in the exhibit too. Private group tours are offered for the exhibit. As well as, school field trips are available for the exhibit through the museum's Mathematics in Design & History program for grades Pre-K through 6th grade. Mathematical geometric shapes are highlighted as a part of the exhibit for the field trip. The initial style of the Lilly clothing designs were simple shift dresses that appealed to a wealthy client base that included Lilly�s boarding school friend Jacqueline Bouvier Kennedy. And others who wore the Lilly designs were various descendants of the Gilded-age titans who included the Rockefellers, Vanderbilts and Whitneys. Because the Lilly style was so strongly associated with blue-blood society, Lilly Pulitzer became known as the �Queen of Prep�. 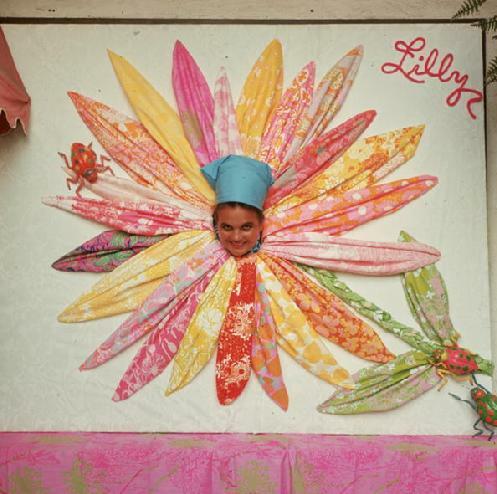 Lilly Pulitzer, Inc. thrived with more than 30 stores eventually offering wares for children, men and the home until the company closed its doors in 1984. During the company's operation in the 1960s to 1984, it had a factory located in Miami, Florida on 29th Avenue between 34th Street. And, the fabrics were designed and manufactured by the Key West Hand Print Fabrics company that was located in Key West, Florida. A special component of the exhibition highlights the contribution of the Key West Hand Print Fabrics, its head designer Suzie Zuzek dePoo and the fabric company's owners Bill Johnson, Peter Pell and Jimmy Russell. Sponsors, to date, include the Boynton Beach Mall-Simon Malls, US 1 AC Storage of Boynton Beach, Christina�s Alterations of Boca Raton; the Patricia Ann Ravo Fund, the Boris & Edith Rueger Fund and The Palm Beach Post. Sponsorship opportunities are still available. If other collectors would like to loan vintage Lilly items for display, they need to mail or e-mail a brief list of their Lilly items to Lillyexhibit@MLFHMUSEUM.org or mail to Museum of Lifestyle & Fashion History at P.O. Box 6127, Delray Beach, FL 33482. For more information, call 561-243-2662.